The NFL today announced that Indianapolis Colts punter Pat McAfee has been named the AFC Special Teams Player of the Week for Week 3. This marks the second time he has earned the award in his career. In the Colts 35-33 comeback win over the Tennessee Titans, McAfee recorded five punts for a 49.8 average (50.0 net) with a long kick of 54 yards and one punt inside the 20-yard line. He also contributed with six kickoff touchbacks and converted a first down on a fake punt run. McAfee’s 50.0 net was the third-best mark of his career for a single game and his 47.5 net average for the season ranks second in the NFL. His six kickoff touchbacks were tied for the fourth-best in a single game as he has recorded 11 on the season. McAfee is the first Colts player to earn AFC Player of the Week honors this season. Last year, he received his first career AFC Special Teams Player of the Week honor in Week 6 for his performance vs. the Houston Texans (10/9). McAfee was selected as AFC Special Teams Player of the Month for the first time in his career on September 2014. The Indianapolis Colts today signed cornerback Shaun Prater and waived cornerback Eric Patterson. Prater, 5-10, 190 pounds, has played in 19 games (three starts) and registered six tackles, seven passes defensed, one interception and five special teams tackles. In 2014, he saw action in 10 games for the Minnesota Vikings and tallied two special teams tackles. Prater played in one game for the Philadelphia Eagles in 2013 before being waived on October 21, 2013. The Vikings claimed him off waivers the next day and he went on to play in eight games (three starts) and total six tackles, seven passes defensed, one interception and three special teams tackles. Prater was originally selected by the Cincinnati Bengals in the fifth round (156th overall) of the 2012 NFL Draft. He spent his rookie season on the Bengals Injured Reserve list before being waived on August 31, 2013 and claimed off waivers by the Eagles the next day. Collegiately, Prater played in 48 games (35 starts) at Iowa and finished with 171 tackles (112 solo), 1.0 sack, four forced fumbles, one fumble recovery, 19 passes defensed and seven interceptions (two returned for touchdowns). He was named First Team All-Big Ten by league coaches and honorable mention by league media as a senior and participated in the East-West Shrine game. Prater started all 13 games at cornerback in 2011 and registered 51 tackles (33 solo), 1.0 sack, four forced fumbles, three passes defensed and one interception (returned for a touchdown). Prater was named First Team All-Big Ten by league coaches and media in 2010 after starting 12 games and tallying 68 tackles (50 solo), one fumble recovery, six passes defensed and four interceptions (one returned for a touchdown). He was named Big Ten Defensive Player of the Week after his 10-tackle performance vs. Michigan State. In 2009, he started 10 games and finished with 41 tackles (25 solo), eight passes defensed and two interceptions. As a freshman in 2008, Prater played in 13 games and totaled 11 tackles (four solo) and two passes defensed. Patterson, 5-10, 193 pounds, was signed to the Colts active roster on September 29, 2015. He has played in two games for the Colts in 2015 and tallied two tackles. Patterson has also spent time on the Indianapolis practice squad. Collegiately, Patterson saw action in 41 games (28 starts) at Ball State and finished with 189 tackles (135 solo), 27 passes defensed and six interceptions. The Indianapolis Colts today signed quarterback Alex Tanney to the practice squad. Tanney, 6-4, 220 pounds, most recently spent time on the Buffalo Bills practice squad after spending training camp with the Tennessee Titans. In 2014, he spent the final two weeks of the regular season on the Titans practice squad. Tanney was on the Dallas Cowboys practice squad for the first 12 weeks of the 2013 season before he was signed to the Cleveland Browns active roster on November 26, 2013. He spent five games on the Browns 53-man roster and did not see any game action. Tanney originally signed with the Kansas City Chiefs as an undrafted free agent on June 5, 2012 and spent his rookie season on the Chiefs Injured Reserve list. Collegiately, Tanney played in 47 games at Monmouth and set NCAA Division III career records with 14,249 passing yards and 157 touchdowns. He was selected as the Midwest Conference Offensive Player of the Year three times (2008-09, 2011). As a senior in 2011, Tanney finished with a career-high 3,867 passing yards and 38 touchdowns. He redshirted in 2010 due to an injury. In 2009, Tanney was named the Melberger Award winner as Division III’s best player after recording 3,856 passing yards and 44 touchdowns. He set a school record with 50 touchdown passes and threw for 3,848 yards as a sophomore in 2008. Tanney played in 10 games as a freshman and registered 2,678 passing yards and 24 touchdowns. NASHVILLE – The first win of the 2015 season for the Colts came thanks to a 21-point final quarter on Sunday. An early lead and strong finish were the highlights of the Colts 35-33 road win over the Titans (1-2). The Colts (1-2) will now come back home to start the month of October with a visit from the Jacksonville Jaguars (1-2) on Sunday afternoon. Here are FIVE THINGS LEARNED. COMEBACK COLTS – It didn’t look like a comeback would be necessary after a 14-0 start on Sunday, but it definitely was for the visiting Colts. Down 13 points with 12:20 remaining, the Colts offense struck with big plays and the defense provided a key turnover. If this Colts season ends up being something special, look back on this fourth quarter as a key turning point. LOWERY’S MVP DAY – On Sunday, Dwight Lowery turned in one of the better days a Colts defender has had in a long, long time. Lowery’s early pick six came off a crushing hit from cornerback Josh Thomas. Then in the fourth quarter, it was Lowery’s more traditional interception that set up the Colts with a touchdown to take the lead for good. MORE GORE– The 14-carry, 86-yard afternoon for Frank Gore was good for 6.1 yards per carry. The Colts obviously have something in Gore and he’s only going to earn more and more respect from opposing defenses. When the Colts needed to burn some clock and move the chains late, Gore scampered for 25 yards and then punched one in from six yards out. WHAT CHANGED – The Colts jumped out to an early second quarter lead of 14-0, however it wouldn’t last. An inability to consistently pressure Marcus Mariota allowed the Titans rookie to get into a serious rhythm. The Colts offense struggled mightily with penalties during this stretch, too. In the fourth quarter comeback, Luck was pressured just twice on 14 pass attempts. DIVISION CONTROL – After three weeks of the NFL season, all four AFC South teams sit at 1-2. The Colts won their 14th straight AFC South game on Sunday afternoon, one shy of an NFL record for consecutive division victories. The Colts will now host Jacksonville on Sunday before heading to Houston a week from Thursday. The Indianapolis Colts today elevated cornerback Eric Patterson to the 53-man roster from the practice squad and waived/injured cornerback Sheldon Price. If Price clears waivers, he will revert to the Colts Injured Reserve list. Patterson, 5-10, 193 pounds, was signed to the Colts practice squad on September 23, 2015. He previously spent one week on the active roster for Indianapolis and recorded two tackles in Week 2 against the New York Jets on Monday Night Football. Collegiately, Patterson saw action in 41 games (28 starts) at Ball State and finished with 189 tackles (135 solo), 27 passes defensed and six interceptions. Price, 6-2, 198 pounds, spent each of the last three seasons with the Colts. He played in two games for Indianapolis in 2015 and registered one tackle. In 2014, Price spent the first 14 games of the season on the practice squad before being elevated to the active roster on December 15, 2014. He was inactive for the final two weeks of the regular season and all three postseason contests. Price spent most of his 2013 rookie season on the team’s practice squad before being elevated to the 53-man roster on December 26, 2013. He was inactive for the regular season finale and both postseason games. The Indianapolis Colts today signed cornerback Eric Patterson to the practice squad and released guard David Arkin from the practice squad. Patterson, 5-10, 193 pounds, was waived by the Colts on September 22, 2015 after being elevated to the team’s 53-man roster on September 18, 2015 from the practice squad. He saw action against the New York Jets on Monday Night Football in Week 2 and recorded two tackles. Collegiately, Patterson saw action in 41 games (28 starts) at Ball State and finished with 189 tackles (135 solo), 27 passes defensed and six interceptions. Arkin, 6-5, 310 pounds, was signed to the team’s practice squad on September 18, 2015. He has played in one regular season game and three postseason contests with the Colts and Miami Dolphins. In 2014, Arkin spent the majority of the season on the Colts practice squad before being signed to the active roster and competing in all three of Indianapolis’ postseason games on special teams and in tackle-eligible situations. He was originally selected by the Cowboys in the fourth round (110th overall) of the 2011 NFL Draft and spent time on the Cowboys and Seattle Seahawks practice squads. INDIANAPOLIS – For the second straight season, the Colts will attempt to dig themselves out of an 0-2 hole to start the year. Following a 20-7 loss to the Jets on Monday night, the self-inflicted negatives once again plagued Indianapolis. The Colts (0-2) will return to practice on Wednesday with preparations for three straight divisional games coming. OFFENSIVE ANSWERS – The Jets brought the pressure on Monday night in the form of 11 quarterback hurries at Andrew Luck. The constant attack from the Jets defense forced five Indianapolis turnovers on Monday. The Colts have been shut out in the first halves of each of their first two games. NO MORE SINS – Chuck Pagano pointed to them right at the start of his post-game press conference—five turnovers and 11 penalties. The Colts eight turnovers through two games are the most in the NFL. In 2013, the Colts led the NFL in fewest committed turnovers/penalties but they are now at the opposite end of the league in those mistakes. The sins (self-inflicted negatives) continue to bog down the Colts offense. INJURIES ADDING UP – When Vontae Davis exited with a concussion in the second quarter on Monday, the Colts were down their top four cornerbacks. Dwayne Allen also left Monday’s loss in the first half due to an ankle injury. Allen is listed as “day-to-day”, while Davis will enter the concussion protocol. HENRY ANDERSON CAN PLAY – After two weeks in 2015, no NFL defensive lineman has more tackles than rookie Henry Anderson. The Colts third-round pick had five more tackles on Monday night and also had a sack of Ryan Fitzpatrick. 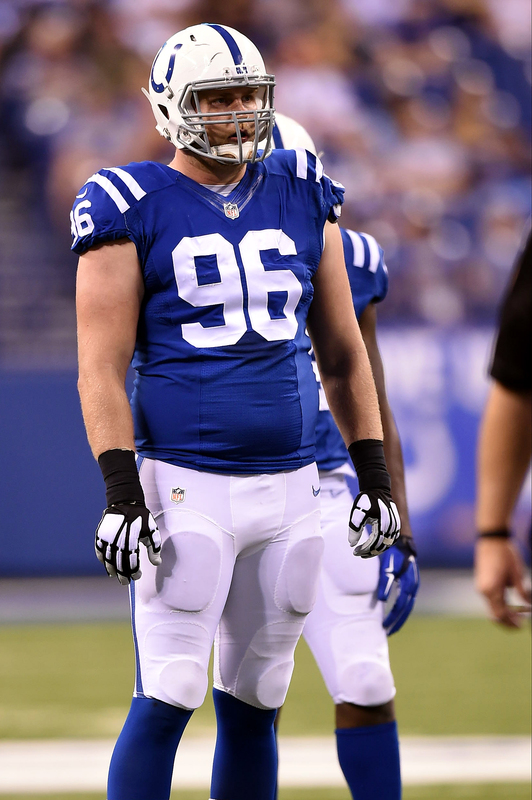 The Colts definitely have something to build around in the defensive front with Anderson and David Parry. DIVISION TIME – For the second straight season, the Colts sit at 0-2 after two weeks. They now will play three straight games against the AFC South (at Tennessee, Jacksonville, at Houston). The Colts have won 13 straight games against the AFC South. This week’s “Back-Up of the Game” presented by Venyu is defensive end Henry Anderson. A defensive line need this offseason for the Colts was evident, and the team has found a rookie that has more than filled his duty in the trenches. Third-round pick Henry Anderson has delivered through his first two NFL games, putting together five-tackles, one sack and two tackles for loss in the box score on Monday night. After two games this season, Anderson leads all NFL defensive linemen with 12 tackles. On Monday, the Colts run defense was pretty stout against the Jets before a couple of late runs in the fourth quarter. New York had just 21 rushing yards on 13 carries at halftime. Anderson was once again a major focal point in that performance. He did record his first NFL sack on Monday, but the Stanford product knows the unit needs to create more of that havoc. “I think we did a good job stopping the run, for the most part,” Anderson said. The Indianapolis Colts today elevated cornerback Eric Patterson to the 53-man roster from the practice squad and placed cornerback D’Joun Smith on Injured Reserve/Designated for Return. The team also signed cornerback Brandon Dixon to the practice squad. Patterson, 5-10, 193 pounds, was signed to the Colts practice squad on September 6, 2015. He played in 41 games (28 starts) at Ball State and finished with 189 tackles (135 solo), 9.0 tackles for loss, 1.0 sack, 27 passes defensed, six interceptions and three forced fumbles. As a senior in 2014, he was named All-Mid-American Conference third-team on defense and All-MAC first-team as a kick returner. Smith, 5-11, 193 pounds, was drafted by the Colts in the third round (65th overall) of the 2015 NFL Draft. In 44 career games at Florida Atlantic, he totaled 120 tackles (78 solo), nine interceptions, three forced fumbles, two fumble recoveries, 1.0 sack and 29 passes defensed. Smith also was a standout special teams performer and registered 47 kickoff returns for 1,093 yards (23.3 avg.). He earned Second Team Conference USA honors as a defensive back and honorable mention recognition as a kick returner as a senior captain in 2014. Dixon, 5-11, 203 pounds, played in 14 games for the Tampa Bay Buccaneers as a rookie in 2014 and totaled nine tackles (eight solo), one interception and two passes defensed. He most recently spent time on the Seattle Seahawks practice squad before being released on September 12, 2015. Dixon was originally drafted by the New York Jets in the sixth round (195th overall) of the 2014 NFL Draft. Collegiately, Dixon played two years at Northwest Missouri State (2012-13). In 2013, he garnered First Team All-Mid-America Intercollegiate Athletics Association honors after starting all 14 games for the Bearcats and recording 36 tackles (25 solo), one interception, 11 passes defensed and one fumble recovery as Northwest Missouri State captured the NCAA Division II championship. In 2013, he started 13 games and finished with 38 tackles (31 solo), five interceptions and five passes defensed. Prior to Northwest Missouri State, Dixon played one year (2011) at Joliet Junior College (IL). The Indianapolis Colts today signed guard David Arkin to the practice squad and released guard Robert Myers from the practice squad. Arkin, 6-5, 310 pounds, has played in one regular season game and three postseason contests with the Colts and Miami Dolphins. In 2014, Arkin spent the majority of the season on the Colts practice squad before being signed to the active roster and competing in all three of Indianapolis’ postseason games on special teams and in tackle-eligible situations. He was originally selected by the Cowboys in the fourth round (110th overall) of the 2011 NFL Draft and spent time on the Cowboys and Seattle Seahawks practice squads. Myers, 6-5, 335 pounds, was signed to the Colts practice squad on September 15. He was originally selected by the Baltimore Ravens in the fifth round (176th overall) of the 2015 NFL Draft. Myers appeared in 46 games (35 starts) at Tennessee State, starting his final 29 consecutive games for the Tigers.